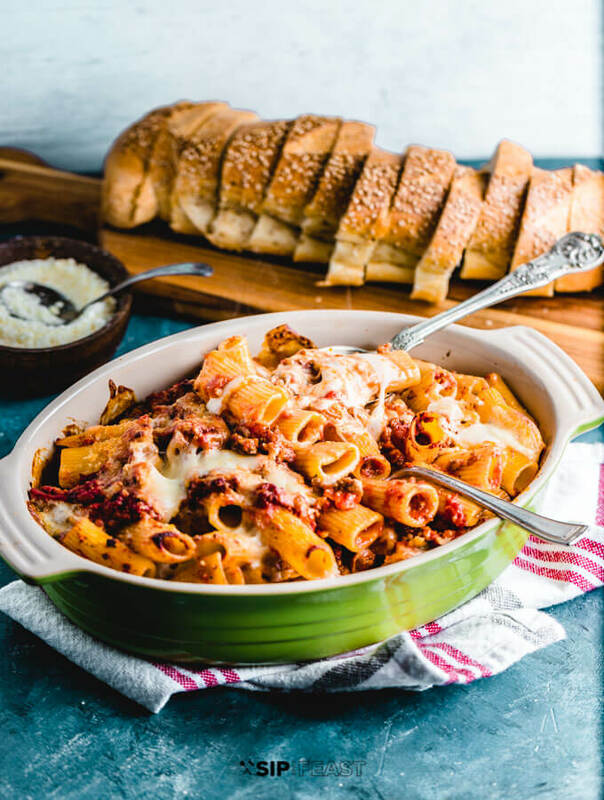 Pasta al forno is a delicious comforting meal that the whole family will love! It’s hard to think of food more hearty and warming than oven baked pasta. Everyone loves it! I really have never heard anyone say that they don’t. But I’m sure there’s someone out there who doesn’t. This recipe is for 99.99% that do. 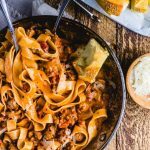 What Is Pasta Al Forno? Pasta al forno is oven baked pasta. There are many variations such as red sauce or in bianca. Some use meat sauce with ground pork, beef and veal. Others are non meat with block mozzarella, fresh mozzarella and/or a bechamel sauce. 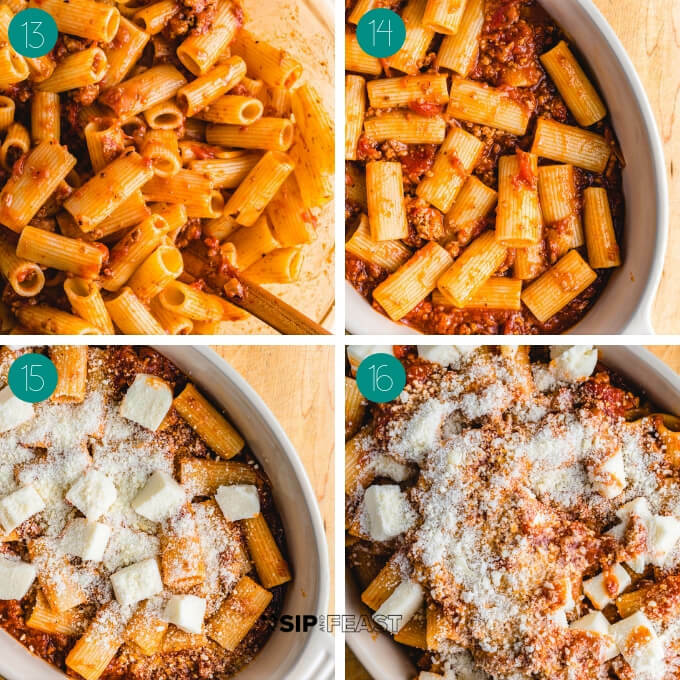 Many types of pasta can be used with short pastas such as rigatoni, penne and ziti being optimal. This recipe is for rigatoni al forno. 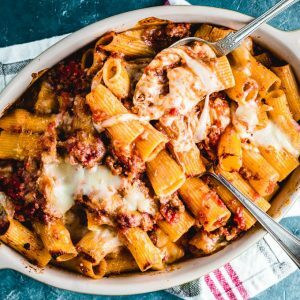 Rigatoni is my number one choice for a baked pasta recipe. It’s a big pasta with ridges that hold the sauce and cheese so well. You really can’t go wrong though with any short pasta, so if in a pinch, use what you have or what you like! 1 pound ground beef – 80/20 ground chuck or 90/10 ground sirloin are both fine. 1 pound ground pork – If not able to find just double the beef amount. 3 28 ounce cans plum tomatoes – Good quality San Marzano plum tomatoes are preferred. 1 6 ounce can tomato paste – I buy tomato paste in bulk. It’s always good to have it on hand. 1/2 cup dry white wine – The wine is optional. If using, Pinot Grigio is a good choice. Don’t use a sweet wine. salt/pepper/crushed red pepper flakes – To Taste. 1/4 cup olive oil – For sauteing the onions and garlic. 1 pound rigatoni – Penne, ziti, and shells are all good choices as well. 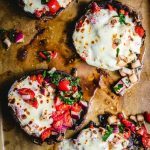 1 pound block mozzarella – For this recipe, block mozzarella is preferred over fresh. 3/4 cup pecorino – Buy a large block of pecorino and grate when needed. If you like parmigiano reggiano instead, by all means use it! Picture of some but not all of the ingredients. Grate the pecorino and cube the mozzarella cheese. Crush the San Marzano plum tomatoes by hand. 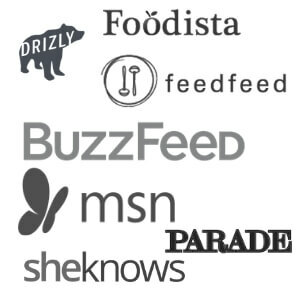 Alternatively, pulse blend for a second. Heat a large sauce pot or dutch oven to medium heat and saute the onions in 1/4 cup olive oil for 5 minutes until almost translucent. Add the garlic and saute for a couple minutes more. Next add the ground beef and pork and spread around pan. Brown the meat. Break it up with a wooden spoon to avoid having any large pieces. After the meat is cooked through (about 10-15 minutes), add the tomato paste. Cook the paste for 5 minutes mixing it into the meat thoroughly. Add the 1/2 cup of white wine and cook for 5 minutes more. Add the plum tomatoes to the pot and stir it all together. Let the sauce cook for at least 30-60 minutes, stirring every 15 minutes or so, the longer the better. Simmer it on low heat with the lid partially open. Cracking the lid allows a slow evaporation that thickens the sauce. Taste test the sauce and adjust salt, pepper, and crushed red pepper if desired. At this step I add salt only. Do not go overboard as there will be a lot of salty cheese being added to the rigatoni al forno. Boil pasta and undercook it even slightly more than “al dente”. The reason for this is if you use fully cooked pasta and bake it for another 30-40 minutes it will become overcooked and too soft. 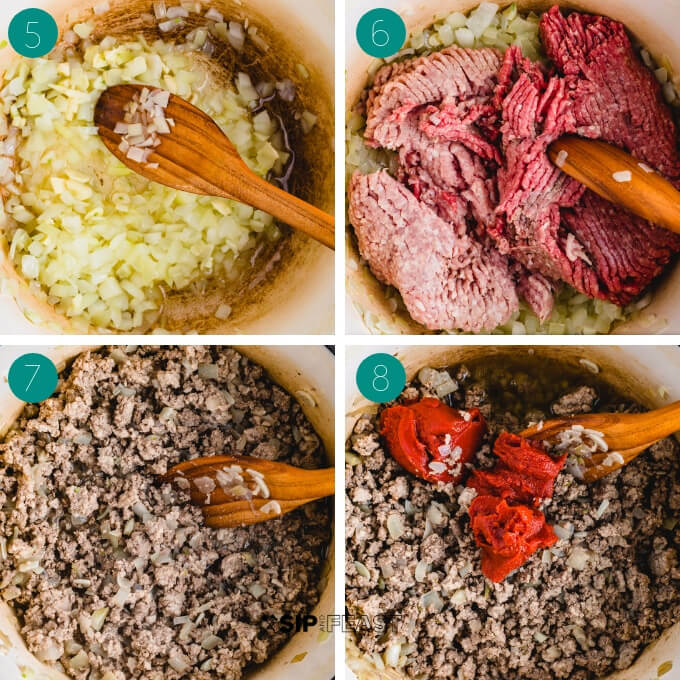 Place 3 cups of the meat sauce in a large bowl. Mix the “al dente” rigatoni into the bowl with the 3 cups of sauce. Use a baking dish or cast iron pan and oil the bottom with a couple Tablespoons of olive oil. Use a paper towel to get the oil fully coated. Next add a ladle of sauce to the bottom of the pan and spread it around evenly. Top with the first layer of pasta. Spread half the cubes of mozzarella around and sprinkle a 1/4 cup of the pecorino on top. Again add another layer of pasta. Add a little bit more sauce on top, then add the other half of mozzarella and another 1/4 cup of pecorino. A drizzle of olive oil is never a bad idea. 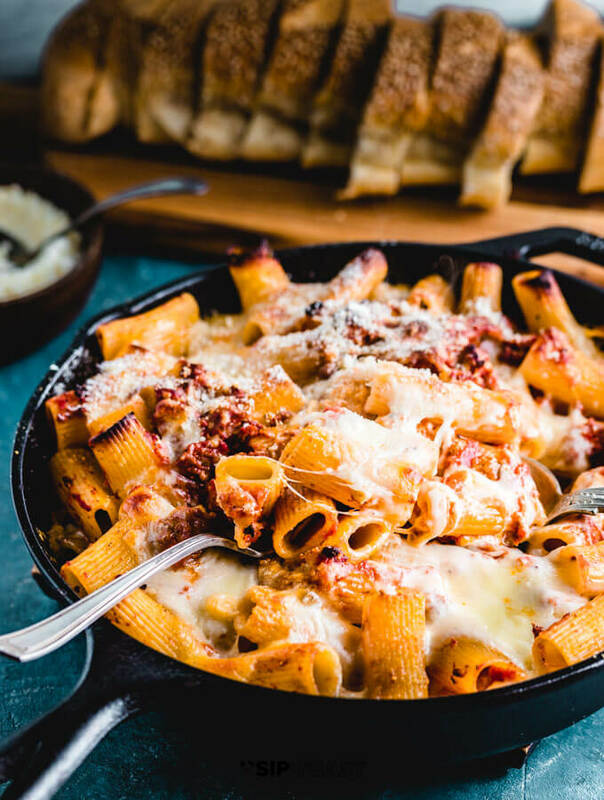 Bake in the oven for 30-35 minutes at 375f or until the rigatoni al forno is bubbly. 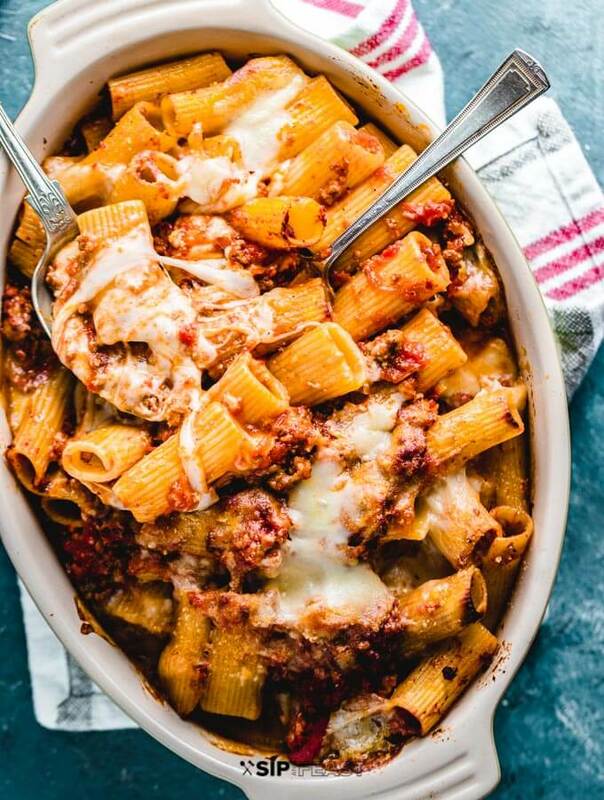 After pulling the rigatoni al forno out make sure to serve with more grated cheese, all of that delicious sauce and a good loaf of Italian bread. 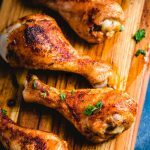 no meat – Of course it’s fine to omit the meat, especially if time is short. I would recommend using more garlic and some fresh basil to add some nice flavor for a quicker pasta bake. 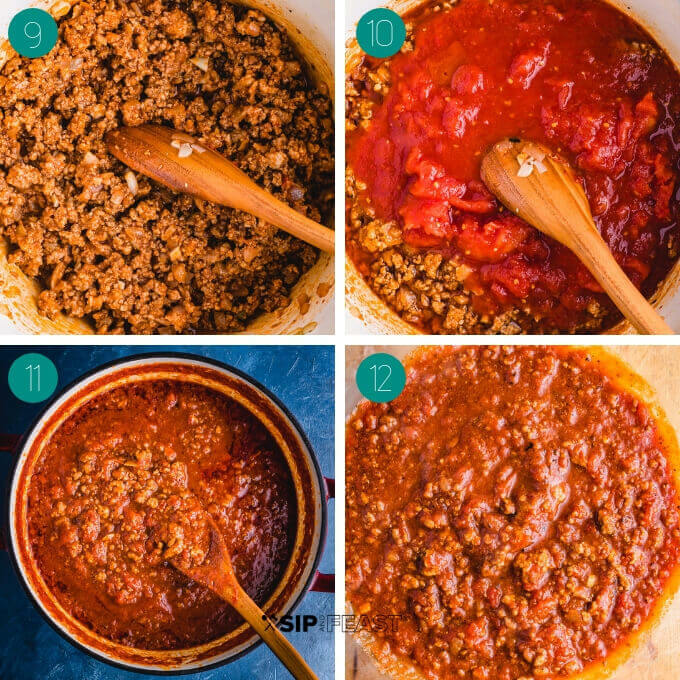 I do feel the meat adds such a depth of flavor and the longer it cooks the better the sauce tastes, so if you have the time go for the meat sauce low and slow. bechamel sauce – Love this addition – I especially like it with a pinch of nutmeg in a pasta bake. ricotta – Absolutely delicious addition. Normally I make a similar dish to this with ricotta added in. I call it my baked ziti. Most Italians in America have their own version as well. My family and especially my kids understand the difference when Daddy is making baked ziti versus pasta al forno. I believe the secret to making any type of great sauce is to leave the spice cabinet alone. 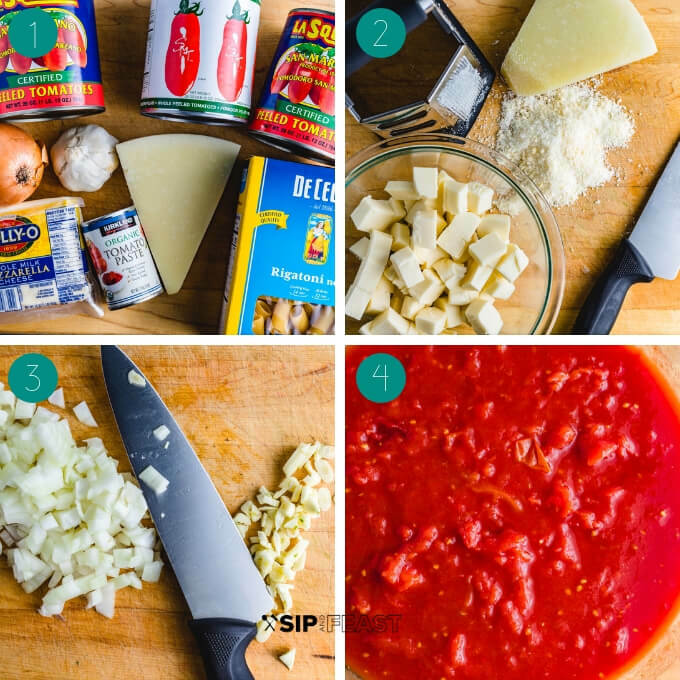 All sauces start with good whole San Marzano plum tomatoes or fresh ones from the garden. Good olive oil, sometimes garlic, onion, fresh basil, oregano, salt, pepper and not much else. I rarely use dried herbs, as I love to let the fresh ingredients do the talking. For the sauce in this rigatoni al forno recipe, the meat is the main flavoring agent. The longer it cooks, the tastier the sauce will become. A little wine (I used white) is good as well. Use red if you like and it will give a delicious flavor all its own. I often use red wine for my Sunday gravy. 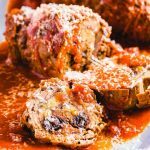 Meatballs, Braciole, sausages, sometimes pork chops and chicken wings are added to make the sauce unbelievable! One last thing, and I really should make a larger FAQ, Sip and Feast does not use jarred sauce ever. It was a struggle for me deciding whether to put up pizza recipes with Store Bought Pizza Dough. I opted for it simply because I do believe you can get excellent results with it. However, I personally believe you can not get any type of good result with jarred sauce. One last thing. In the time it takes to heat up jarred sauce, you could be halfway through making a quick fresh tomato sauce. On a scale of 1-5 with 1 being easy this recipe is a 2. Though it takes a bit of time this recipe is essentially set it and forget it with the sauce and basic assembly of the pasta layers. Only potential issue is to make sure to undercook the pasta. The pasta will be baked for 30 minutes so it’s important to start the bake with “al dente” pasta. Red wines go great with hearty pastas. 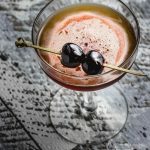 Chianti and Cabernet are both good choices. If you’re in a spending mood an Amarone is always amazing! 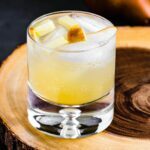 For a mixed drink give this Moscato Sangria A Try. 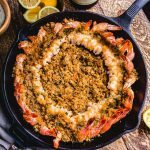 If you liked this pasta al forno recipe we’d really appreciate it if you would share it with #sipandfeast on Instagram or Facebook. Grate pecorino cheese and cube the block mozzarella. Chop onion and mince garlic. Crush the plum tomatoes by hand or pulse blend for 1-2 seconds. In a large sauce pan on medium heat saute onions for 5 minutes in 1/4 cup olive oil or until translucent. Add the garlic and saute for 2 minutes more. Add ground beef and pork to pot and brown for 10-15 minutes until cooked through. Break up any large pieces with wooden spoon. Next, add the tomato paste and cook for 5 minutes more, mixing it all together. Add the 1/2 cup of wine and cook for 5 more minutes. Add crushed plum tomatoes to pot and stir it all together. Once sauce starts bubbling turn heat to low and simmer for 30 plus minutes, the longer the better. Leave the pot partially covered while cooking and stir every 15 minutes to avoid sticking. After the sauce has been simmering for a while boil pasta to "al dente" in salted (2 Tbsp kosher salt per gallon) water. Taste test the sauce and make any changes to salt or pepper if needed. Place 3 cups of the sauce in a large bowl with the cooked pasta and mix well. Lightly oil a large baking dish and place a ladle of sauce on the bottom. Layer some of the pasta on top. Add half the cubed mozzarella and 1/4 cup of the pecorino all over. Repeat with more pasta, a little bit of sauce, the remaining mozzarella and another 1/4 of pecorino. Bake in a 375f oven for 30 minutes or until bubbly. 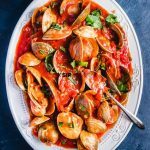 Serve with Italian bread, extra sauce, and grated pecorino. Enjoy! Makes 4 large or 6 good size servings. Make sure to taste test the sauce and adjust if necessary. Salt was kept down because of the added pecorino cheese. If the tray looks a little dry before baking, add another ladle of sauce. Nothing has to be exact in this dish! There will be a lot of sauce left over. Around 4 cups most likely depending on simmering time. Serve with crusty bread for dipping and ladle it over the plated dishes for anyone who likes more sauce. The remaining sauce can be frozen for 4-6 months. 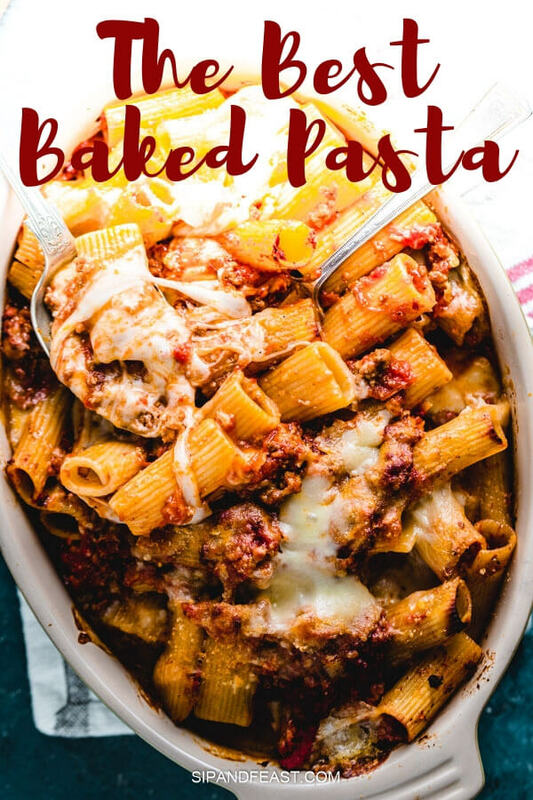 There’s something so perfect and comforting about baked pasta. I especially love the bits of pasta that become crispy in the oven, and your ingredient list sounds delicious! I’m and definitely in the 99.99% that would LOVE this! Thanks so much Valentina. I love those bits too, I feel if you don’t see them, it needs to go back in the oven for a few minutes!